I'm not only moving in my personal life but my office at work is moving to an entirely different postcode. I do know how to get stressed out don't I?! I've been going through all my office draws, so I thought I'd share the beauty bits I have hiding away in them! In reality I probably have far too much in my desk draw, as I always carry bits & pieces around with me in my bag. I'd rather be prepared than be stuck with mascara running down my face or a shiny nose! I always have a mascara in my draw, you never know when your going to need a top up! I currently have a CID mascara, it's a lovely deep black that's long lasting and helps top up my usual Eyeko Skinny Mascara. It doesn't clump, survives the rain quiet well and it doesn't dry & flake! I hate coloured powders, I always find I end up looking cakey, a look I don't want when I'm sitting in a meeting! I love this transparent powder as it helps control my shine and keeps my foundation looking lovely. I use this a few times during the day to keep the shine at bay and us a little travel brush, definitely one I couldn't be without. I LOVE these blushers! £1 and they give awesome, buildable color! I don't have to top them up very often but I do like to if I'm looking a bit pale and I'm on my way out the door. I love most of the colours too and at £1 you can afford to have a few on the go! Normally I hate lipgloss, I am a matt lipstick kinda girl. This particular lipgloss has been a game changer for me. It's not super sticky, doesn't slide off your mouth and adds a hint of glossy color. I love it for days I don't want to wear full lipstick or heavy makeup and it's perfect for popping on, on the go! I use this all the time. It smells utterly gorgeous, leaves your skin feeling soft and supple and sinks in, in moments. I use this for my hands mainly but I do use it at home as my all over moisturiser. I do sometimes, use it as my face moisturiser! I always have hairspray in my desk draw. You never know when you might need it! I love being able to just fix my hair without having to fuss! 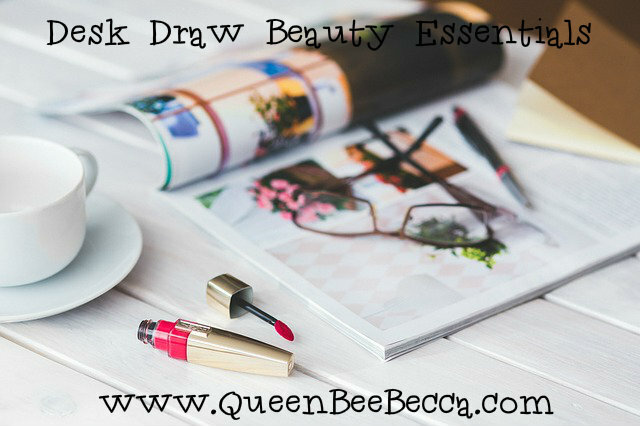 Have you got any beauty essentials hiding in your desk draw? This is why i wish I had a desk at my work, I have the smallest locker known to mankind! These are all the things I would have in my draw though if I did. I love that rimmel powder, I too hate any powder with colour so I always opt for a transparent!